Prototype: Two (2) German Federal Railroad (DB) commuter cars. One (1) type BDmrzf 784.2 car, cab control car with a baggage area, and one (1) type ABnrzb 772.3 car. Use: Commuter service. Model: The cars have close coupler mechanisms. Interior lighting can be installed in the cars (cab control car excluded). The cab control car has automatic white headlights and red marker lights that change over with the direction of travel. They can be controlled digitally with the function decoder and they also work in analog operation. The cars are authentically painted and lettered. Total length over the buffers 330 mm / 13". 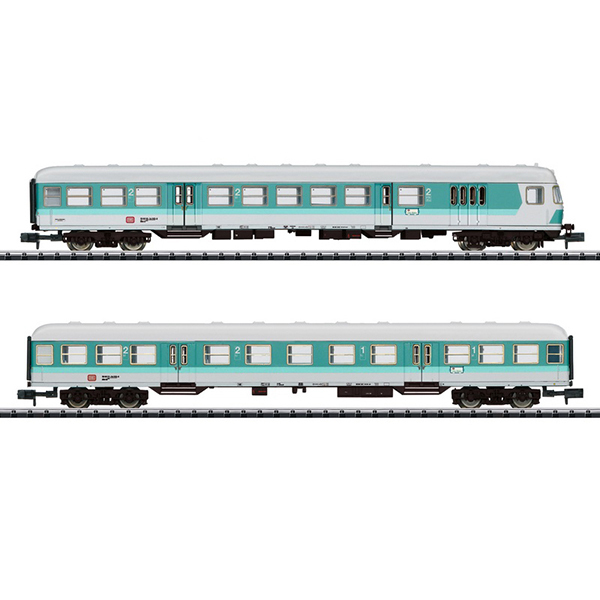 You can make a complete train with the car, 2nd class, available as item number 15468, and the class 141 electric locomotive, available as item number 16144.